The story of the photo ... Mixed emotions. Don’t we always see that in every wedding ceremony we witness? Even before ceremony starts, evidence of joy, fascination, surprise, separation anxiety, and a dash of loneliness are always present. This timeless photo captured by Denver wedding photographers here is one such obvious evidence. We can only surmise how the feeling of happiness and sadness battle inside this man’s heart. He sees his daughter looking so perfect and happy on that wedding dress, yet the lonely heart of a father cannot be hidden with those tears nearly falling from his eyes. For how can you not feel even an ounce of sadness when the girl you’ve always wanted to protect is finally leaving your house for good to live with another man whom she will start a new chapter of her life with? 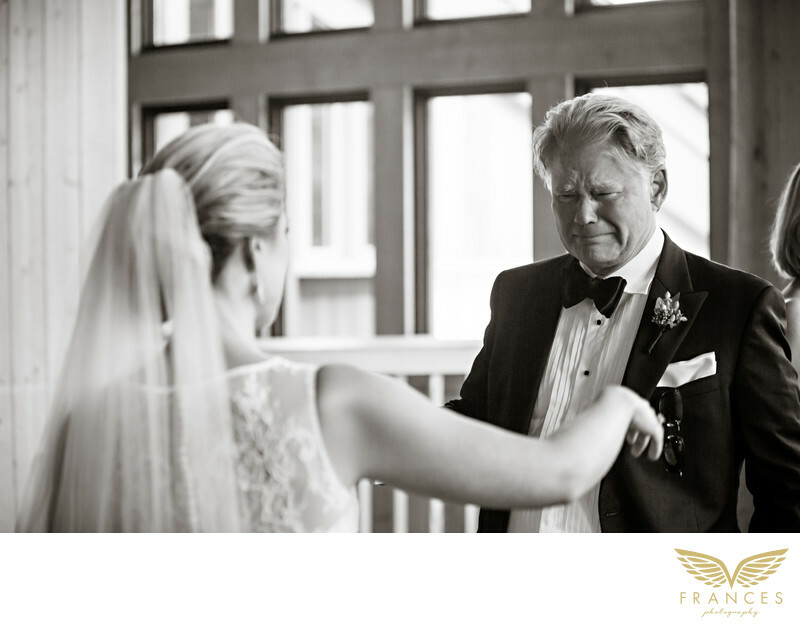 With one glance on this image, you can easily sense the overwhelming emotions of the father’s bride as he realizes that his little girl is tying the knot with another man a few moments from now. For a father, you can only imagine how confusing it feels. You’re ecstatic that your daughter has found a man to love for the rest of her life, but you can’t avoid feeling anxious that you’re handing her over to this man to whom she will give her all. As if the father’s genuine facial expression is not enough, the wedding photographer behind this image gave a brown toned black and white for the picture to make this timeless picture even more dramatic. The story of the day ... September 10, 2013 - Not only was this one of my favorite weddings of all time, but this couple truly stole my heart. How much do I adore Regan and Jack? Let me count the ways...First, they met on a blind date. Thanks to the proximity of their families being friends and the intuition of Jack's younger sister Morgan, it all began over brunch in New York City. And even though they were living on opposite sides of the country at the time (Regan in NY and Jack in SD), well, love knows no distance. Their wedding was a black time mountain fairy tale. Fulfilling their dream to get married on a mountaintop, they exchanged their vows amid the breathtaking views of the Beaver Creek Wedding Deck while tugging at everyone's hearts. Accompanied by her dapper groom, Regan was an absolutely stunning bride. The color palette of corals, creams and green was playful and perfectly transitioned into a lovely reception at Beano's Cabin. The abundance of natural birch, candlelight, roses and hydrangea made for stunning tablescapes and a warm atmosphere. Love and laughter filled the room from the bottom up. Their first dance song was "Smile" by Uncle Kracker, the song that reminded them of each other at the beginning of their long-distance love story. "There was something about the other person that just made us so incredibly happy, and even from 3,000 miles away, we could put a smile on each other's face," said Regan. I hope my photography was able to capture this true love and happiness. Her dad was quite the hit during the reception, too. From playing Neil Young on the guitar during dinner to a surprise father-daughter dance number to busting out a little Mustang Sally later on, he was just the best. I don't think anyone stopped smiling or grooving during this grand party. Between Funkiphino's energy and paper lanterns a plenty, the mood was magical. Thank you from the bottom of my heart to Jack and Regan for including me in this special occasion. Your friends and families are amazing and you truly made me feel like one of yours. Major props to Emily from Bella Design and Planning, who I can only hope to work with again. And to all the other vendors who helped make this day as perfect as it was, bravo to you all! Here are some additional photos of this incredible wedding event. Location: 15 W Thomas Pl Avon, Colorado.